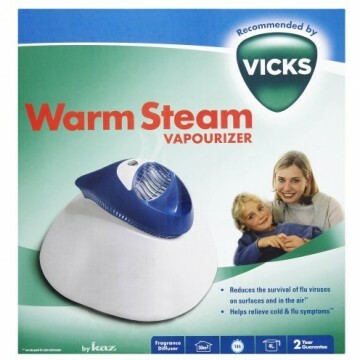 The Vicks warm steam Vaporiser produces pure, warm steam which is free from bacteria, minerals and other impurities. It is a great drug free alternative relief for cough, colds and croup. Produces pure, warm steam which is free from bacteria and other impurities, it restores moisture to dry indoor air. Proper humidity levels in the home can improve the ability of your respiratory system to expel germs from the body and also ease other types of discomfort caused by dry winter air, such as a dry nose and throat, itchy skin, and dry eyes. Advanced electric safety controls ensure that the vaporiser automatically shuts off when it runs out of water and must be disconnected and reconnected to restart (i.e. unplugged). Unique air design provides 25% cooler steam than conventional steam vaporisers. Includes Medication cup for option to add essential oils.